Lots of manufacturers claim to have the best chew toys for German Shepherds. 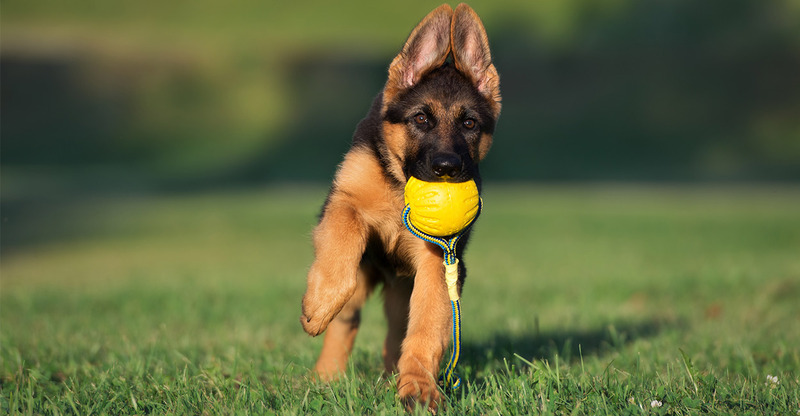 In this article, we reveal who really makes the chewiest, most indestructible, most appealing toys for German Shepherds! The larger the dog, the more high energy they tend to be. Chewing is a completely normal way for a dog to use up some of that energy: it exercises their jaws, cleans their teeth and gums, and passes a little time. German Shepherds are big dogs with energy in spades, finding the right chew toy is very important. The chances are, it’s really going to be put through its paces! Why do German Shepherds need chew toys? 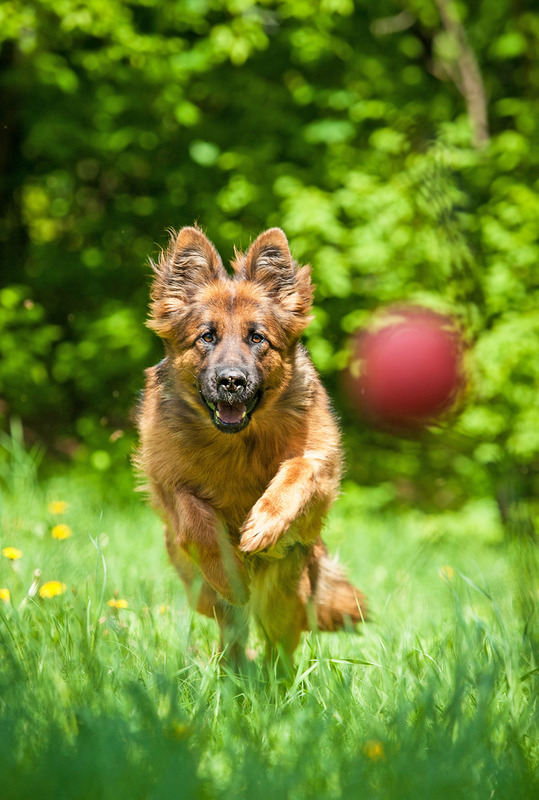 German Shepherds are highly energetic, very intelligent and quite strong. So it’s important to keep them properly entertained and exercised. Pair that with a dog’s natural instinct to chew, and a good chew toy becomes one of the most important items you can buy for your dog. You’ll have your German Shepherd chewing on the right thing, instead of random things around your house. It will save your favorite shoes and furniture, and keep your dog occupied and happy. What are the best chew toys for German Shepherds? When deciding on the best chew toys for German Shepherd dogs, you need to consider several things. You need to know how hard your dog chews so the toy you buy isn’t in pieces hours after you bring it home. If your dog is rough when they play, toys like braided ropes or stuffed characters will barely last. German Shepherd chew toys should be made for durability. Look for rubber toys that they can pick up and carry around. The rubber should be hard enough to endure a mauling, but not so hard that it could damage their teeth. Toys labeled as “indestructible” will have more longevity against your dog’s habits. So let’s get to it and dive in with some of the German Shepherd chews toys we believe to be the most hardwearing and indestructible. This nylon, non-toxic bone for aggressive chewers is an indestructible toy in a size designed specifically for German Shepherds. It has a bacon scent to make it even more appealing to dogs. Along with being a safe and indestructible chew toy, it helps clean teeth as well. This chew toy will keep your German Shepherd satisfied, entertained, and healthy. If your German Shepherd likes to chew on a ball, then Snug Rubber Ball is a great indestructible alternative to typical ball toys. It’s made of all natural rubber and is FDA compliant, so it’s safe for your pet to chew. This toy has over 2,100 5-star reviews on Amazon, with most customers saying that they stand up well to chewing while still being bouncy. So you know it’s safe for your German Shepherd’s teeth! The Goughnuts chew ring was designed by engineers and guaranteed to be near indestructible. They’re so sure, that Goughnuts will replace your toy if your dog chews through the outer layer. The ring shape means that your German Shepherd will rarely chew the same spot twice, which reduces the possibility of wear. The toy comes in 6 colors and is made in the USA. Almost all customer reviews back up the claim that it is indestructible, or at least near so. Though they do warn that some dogs don’t like the taste. But between the sturdy material and the lack of weak points, this chew ring should last your German Shepherd for a long time! Kong is one of the top brands of dog toys in the world. The Totally Dog Training team have owned plenty of Kong dog toys, and they never fail to impress us. We think these are the best chew toys for German Shepherds from Kong. This classic Kong toy design will keep your dog chewing for a long time. Its hollow design allows you to add things like treats or peanut butter to keep your dog satisfied for even longer. The Kong Extreme line is designed for aggressive chewers, and will hold up against most high energy dogs. With legions of fans, your German Shepherd will love this toy, and it’s durable enough to last against even the toughest chewers. What dog doesn’t love a bone? This Kong Extreme goodie bone is made from durable rubber that’s safe for extreme chewers. It has holes on the ends, which are perfect for adding treats for your German Shepherd to dig out. It has won rave reviews from dog owners, including several German Shepherd owners who say this bone stands strong against the toughest teeth. If you’re looking for a toy made for tough chewers, look no further than the Kong Extreme Tire. It uses the same durable material as all Kong Extreme toys, and the tire shape and texture are designed to stand up to intense gnawing. Most Amazon customers with powerful chewers say that the Kong Tire keeps their dogs entertained and can withstand prolonged play. The Benebone Wishbone Chew Toy is a great choice for German Shepherds who want a fun toy. The Y-shape makes it easier for dogs to hold as they chew, and the bones are made with real food flavor. You can choose from bacon, peanut or chicken for your German Shepherd to enjoy. One of the most common words used by reviewers is “durable,” so your German Shepherd will be entertained by this tasty treat for a long time. Another name you can rely on when you’re looking for the best chew toys for German Shepherds is Nylabone. This large size chew bone is flavored like chicken and is marketed as long-lasting. It’s made of durable nylon, and it’s textured for extra enjoyment. This bone will keep your German Shepherd busy, satisfy their urge to chew, and helps clean teeth while they chew. BarkBone’s nylon chew toy is a flavored treat for your German Shepherd to enjoy. It comes in bacon and bbq flavors, and is made in the USA with locally sourced materials. The curved shape of the bone make them easy to hold, and cares for their gums and teeth. Reviewers say that dogs love the flavor, and it holds up to hours of power chewing. Variety is the spice of life, and mixing up ultra-hardwearing synthetic toys with toys made from natural materials is a great way to keep your German Shepherd interested. Antler are a popular option, and they’re a healthier than other chews, such as rawhides, as they have no additives or preservatives. When you offer your dog an antler, you’ll need to take some important steps to keep your them safe. First, only give them natural chew toys when you can be around to keep an eye on them. Natural materials are more likely to break up or splinter than synthetic materials, potential damaging their mouth or creating a choking hazard. Second, antlers can be tough on your dog’s teeth: if they have a history of dental problems, ask your vet first if they will be safe enjoying an antler. Some people would prefer to let their German Shepherd chew on something natural instead of rubber or plastic. This all-natural deer antler is sourced in the USA and is cleaned and sanded for your dog. The extra-large size makes sure that it will withstand your German Shepherd chewing. They have no preservatives and they don’t splinter, so they are safe for your dog. Antlerz brand natural chew toys are made from naturally shed deer antler. It contains no plastic or chemicals.It’s a long-lasting chew and customers note that there is little to no odor on them. Some reviewers warn that occasionally they have received one that has dry rot on the inside, but it can be returned and replaced with a better quality one. Heartland Antlers are Grade A, all natural antlers that come with a 100% satisfaction guarantee. When shopping for good chew toys for German Shepherd puppies, you need to make sure the toy can help them through teething while also withstanding their already-strong jaws. This Nylabone Romp ‘N Chomp is one of the best chew bones for German Shepherd puppies. It can be stuffed with treats and can be frozen, which can soothe sore gums. Since your German Shepherd hasn’t reached its full strength yet, this bone should hold up against your avid chewer. Most customers with large breed dogs say it satisfied their teething puppies and didn’t break down. Dogs iN Action offers a DNA spiral shaped chew toy made of natural rubber. It is a pliable yet durable toy that teething puppies will find soft on their gums. While it won’t withstand chews from full sized dogs, young German Shepherd puppies will certainly find this toy fun! Made specifically for teething puppies, the Kong Teething Stick is an obvious choice for your German Shepherd puppy. It’s made to fit a puppy’s mouth comfortably, is made of durable but comfortable rubber, and the ridges clean their teeth while soothing gums. The ridges can hold peanut butter or other such treats as an added bonus for your pup. As with most Kong products, this stick is highly reviewed, with many people specifically noting how much their German Shepherd puppies enjoyed it. German Shepherds can be high energy and aggressive chewers. When you’re picking chew toys, look for age-appropriate choices and promises of durability. There are lots of manufacturers who have tried to put their own spin on the perfect German Shepherd chew toy. If you can afford it, building up a “library” of toys over time and rotating them is a guaranteed way to keep them fun and exciting for your dog for a long time! Which chew toys does your German Shepherd love? Leave your recommendation and find out what other German Shepherds are chewing on over in the forum!